Having just returned from our stay on Cape Cod, I am greeted with a remarkable development: There are now bike lanes on one of the most hated stretches of road near my neighborhood. While normally I avoid this road, today I found reasons to travel along it multiple times just to experience its Disneyfication - for the city has also planted trees and installed decorative streetlights, in attempts to disguise the faded vinyl-siding of the multi-family homes and the peeling storefront signs that say things like "Used Tires". Why if Boston keeps this up, soon the last of the gritty neighborhoods will turn shiny and pleasant and there will be nothing to complain about! Apparently, we are hardly the only town experiencing such shocking advances in bicycle infrastructure. A friend from Virginia has written me with the news that there are now bicycle lanes in Harrisonburg, and he - a lifelong cyclist sans lanes - does not quite know how to behave in them. Where is one supposed to pass? How to deal with joggers in the lane? 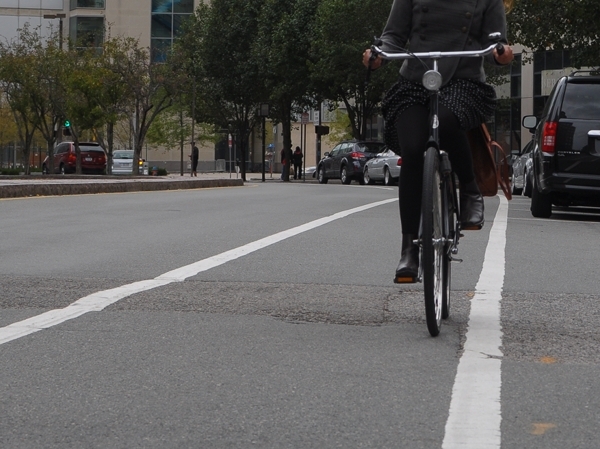 While I am by no means an authority, I will contribute my ideas on bike lane etiquette. Please note that although these contain commentary on safety, they are meant as thoughts on polite behaviour and are not safety tips. It is a good idea to cycle in the left half of the bike lane, as this positioning places you out of the "door zone" (i.e. you will not get struck by a car's door, should one suddenly fling open). Occasionally, a misguided cyclist or driver may shout at you to scoot over to the right, so that they can pass you easier - but don't allow yourself to be guilted into listening to them. Instead, politely explain about the door zone and why your positioning in the lane is necessary. 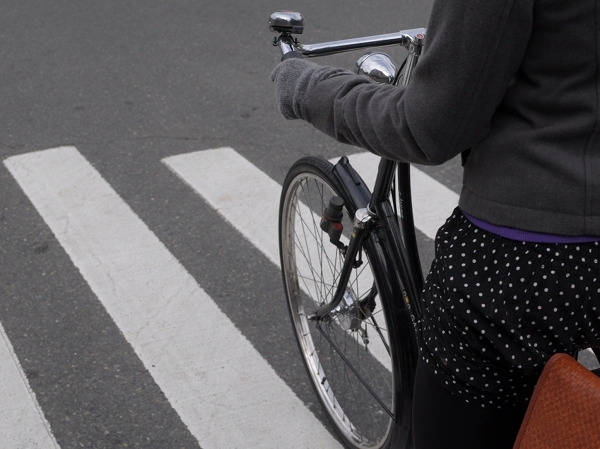 Try to keep to a consistent line within the bike lane; don't weave. Drivers and other cyclists can get freaked out by weaving cyclists, and in turn behave irrationally. Passing other cyclists should be done on the left, never on the right. If you pass on the right, you endanger both yourself and the cyclist you pass, by nullifying the distance between the two of you and the door zone. Pass the slower cyclist by going around them on the left (into the traffic lane), naturally checking that the lane is clear first. Should another cyclist attempt to pass you on the right (you can sometimes sense them coming up behind you), I think it is perfectly fine to tell them not to do this ("Please don't pass on the right" or "Please pass me on the left"). Yield to turning vehicles in the lane, be they cars or other bicycles, instead of attempting to go around them as they are making the turn. Even if you manage to do this safely, it is disturbing to the vehicle to suddenly see you beside them as they attempt to execute a traffic maneuver. If the bike lane intersects a crosswalk, yield to pedestrians in a way that makes them feel safe - don't just cycle around them within inches of their person... And please don't even think of ringing your bell at pedestrians to make them cross faster (I have witnessed cyclists do this in Boston). It is the pedestrian's right to be in the crosswalk and your obligation to yield. On the other hand, it is not the pedestrian's right to be in the bike lane itself, whether they are jogging or rolling a baby carriage, or whether it is a group of people caught up in chatting. If a pedestrian is blocking a bike lane, I think it is only fair to ring your bell and/or politely say something like "Excuse me, bike lane!" so that they move out of your way. It is rude of them to block the lane; it is not rude of you to point out that they are blocking it and ask them to move. When stopped at an intersection, stop before the crosswalk - as opposed to blocking it (as shown above), as some cyclists do in order to get a head start. It's not very nice to make pedestrians go around you as they attempt to cross the street. If other cyclists are already stopped at the intersection when you arrive, it is generally considered polite to stop behind them - as opposed to next to them, in an attempt to compete for who goes first when the light turns green. Communicate your intention to turn by signaling and merging into the turn lane early on, rather than at the last moment, so that drivers are not surprised and can yield to you properly. Observe the same rules as if you were a motor vehicle: When making a left turn, yield to oncoming traffic; when turning right on red, yield to pedestrians crossing and to cross-traffic. 7. Wrong way in the bike lane? I think the reason some cyclists engage in this behaviour, is to make an easier left turn. However, it is wrong and inconsiderate to "salmon" in the bike lanes; please don't do it. And I think it is perfectly acceptable to ask other cyclists not to do it. 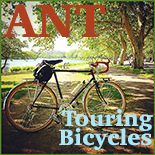 Upon reaching their destination, some cyclists transition onto the sidewalk and continue to cycle - dismounting when they reach the bike rack, or the front door of the building they will be entering. My view is that cyclists should dismount upon reaching the sidewalk, and walk their bike thereafter. As while driving, it is common sense and common courtesy to slow down when executing delicate maneuvers in traffic. It is also common courtesy not to jeopardise the safety of other cyclists, even if you are in a hurry. Sometimes you just have to go with the flow of bicycle traffic, even if technically you are capable of going faster. Please... just be polite. If you are annoyed or frightened by a driver or another cyclist, it is never a good idea to express that sentiment by immediately insulting them or shouting obscenities. An urgent tone of voice does not need to be abusive. "You almost killed me!" in an alarmed voice is more effective than "You almost killed me, you goddamn idiot!" in a hostile voice. While it may be tempting to shout the latter version, consider that doing so can actually escalate conflict and further endanger you. With more cities across the US creating bicycle lanes, the numbers of new cyclists out on the roads is growing. And while different states have different degrees of regulations when it comes to cycling, I think there are certain aspects of using the bike lanes that are a matter of common sense and courtesy. I hope my suggestions are useful to new users of bike lanes. Your feedback, whether in agreement or disagreement, is welcome. oh, man, am i glad the somerville ave reconstruction is finally completed! (which is not to say that there aren't some weird, and potentially dangerous, design problems with the reconstruction). having commuted on this thoroughfare for the past four years, and having been struck by a motorist on it, it was my most detested portion of my commute. the new bike lanes are great, and i've noticed that motorists behave much better than they did when it was an unmarked free-for-all. I've noticed little bike pictures on the car-heavy Somerville portion of Route 28 (near Broadway intersection), for all intents an purposes two six-to-eight lane car highways intersecting--not exactly bike paradise. The bike pictures tell cyclists to stop on the line to request green and are drawn in all lanes, presumably depending on whether you are turning left/right, going straight and so on. I can't tell when these appeared there, maybe I simply didn't see them before as I only drive in that area. And yet just the other day I saw cyclists on the sidewalk riding along the recently added freshly painted bike lanes on Somerville Ave, getting up to a pedestrian crosswalk near a super-market, presumably intending to cross when car traffic dies down and continue on the other sidewalk, on the opposite side of the street. 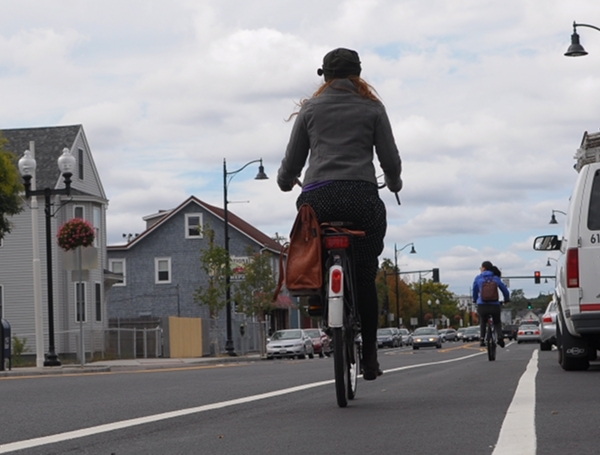 I don't see sidewalk cyclists as often in Boston and Cambridge as I do in Somerville. Don't be silly! I dislike all of Boston, be it ghetto-esque or gentrified, and long to live in the middle of nowhere milking my own clothes and sewing my own cows. As shown in the photos, it is a good idea to ride about three feet to the right of the RH tire tracks, presuming that does not put the cyclist in danger from door openings. 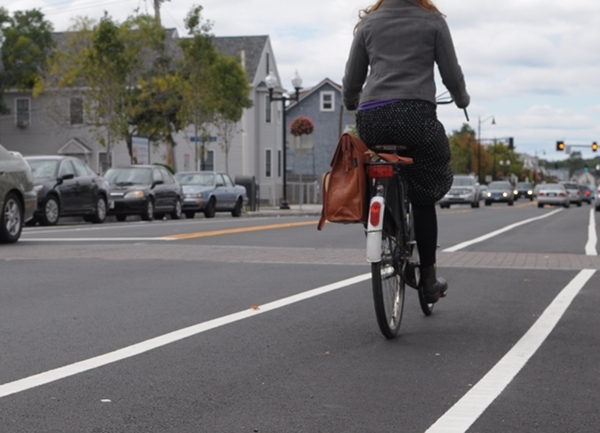 If it is not possible to ride three feet to the right of the RH tire tracks without clearance against door openings, the street is too narrow to have a traffic lane AND a bike lane. Steve - Interesting, I did not know the tire tracks rule. PS Herzog - By "normally I avoid this road", I meant that I avoided it not because of its vinyl sided houses and thriving used tire trade, but because in the past year and a half I was "brushed" by cars on it not one but three times, and several people I know have been struck by cars there. Maybe now they'll repave Beacon St. Or is that too much to hope for? the most common reason I've heard for people who salmon is that they think it's safer to be facing traffic--they think oncoming cars can see them easier, when actually it makes no difference. They also discount that cars turning into an intersection will not be looking for wrong-way traffic. I've probably had as many close encounters with salmons as with cars. I really hate salmons. What a thoughtful article, if only everybody was as considerate. I always try to be considerate. That kind of bike lane while appreciated puts you at risk of being dinged. Vancouver has oodles of bike lanes including a new separated bikeway downtown and specific bikeways which are roads where cyclists have the right of way and hopefully cars avoid. One some streets the bike lanes are in between the bus lane and regular traffic and while it takes some getting used to is actually very safe. My personal pet peeve is people standing on bike lanes or bike ways. Vancouver has bike specific lanes throughout Stanely Park and all the seawall routes but people will stand like cows in the middle of them and wonder why they are being screamed at by angry cyclists. People with strollers, wildly roaming children, dogs you name it will be on the bike lane! I don't know what the etiquette in cities like Copenhagen or Amsterdam, but I highly doubt people would dare stand in the bike lanes. It's supposed to be a way for cyclists to get to their destination quickly without distraction and to be able to just RIDE. And riding against traffic on the bike lane and on the road is very risky. Not only does it disrupt cycling traffic and put others at risk, it puts you at risk. Cars won't be expecting you to be riding the wrong way, won't be looking for you. I have been pushed onto traffic or onto the dirt by people barreling along the wrong way. And most provinces in Canada, cyclists must follow the rules of the road. So if a cyclist is riding against traffic and gets in an accident with a vehicle the cyclist will be found at fault or partially at fault resulting in loss of potential benefits and compensation. I only do it occasionally on my rural routes when I am trying to cross the highway to go down a side road and am trying to beat ferry traffic. I also do not know why cyclists ride on busy sidewalks. You know; downtown where the sidewalk is literally full of people and some nitwit thinks they can just push through on their bike. And it's always grown men who are big and strong enough to ride with traffic! Kids are allowed to bike on sidewalks, but that's it. It is illegal in most places, but as a cyclist there is a certain amount of leeway depending on conditions and consideration for safety. Where I live in rural bike hell some bike lanes were built along some roads in villages and such, but are so poorly designed nobody really uses them. They are too bumpy, too close to driveways, powerline poles in the middle of them, overgrown bushes and brambles that slice open flesh and tonnes of loose gravel, rocks, glass, metal etc.. An extra shoulder was created on one side of the highway I ride on to and fro work. Not sure it was meant to be a bike lane or not, but it's become one. Problem is, it's only on one side, so on the other I still contend with almost no shoulder, piles of gravel, sand, glass etc. Very few people bike out here out of fear. I have no interest in 'taking the lane' as it is unsafe even though I am legally entitled to. Someone wrote a letter to the editor thrashing local cyclists for not using the bike lane that 'taxpayers paid for' and boy did he get lambasted by cyclists! Cyclists actually pay more than their fair share in taxes because bikes and bike gear are not subsidized while the cost of gas is heavily subsidized in North America. If gas cost what it does in Europe, you'd see many more people on their bikes. 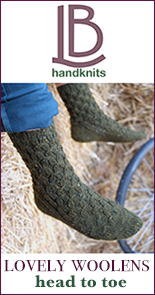 I'm not sure I am understanding the yielding to turning traffic part. Surely if their turning manoeuvre causes you to need to need to take action to avoid hitting them it was performed improperly. In real life this happens innocently all of the time when people slightly underestimate your speed and force you to slow down slightly, but when on the bike I find people turn across the bike lane frequently with a wilful disregard for cyclists, in which case yielding to them will only make the situation worse. Nice post. Jeff Mapes talks about the difference between laws and a 'code of transportaion' in his book pedaling revolution (which I highly recommend)and that people generally accept or reject certain behaviors as we get around, whether they be laws or not. Bikes pose an interesting problem because laws are often unclear, vary from place to place and don't exist sometimes. As bikes become a more important part of American transportation many of these issues will work themselves out. In the meantime, I agree that courtesy and some common sense is the best method. Good luck! God, it would really be so nice if people behaved this way. Cyclists here are really so bad. I cling to Bike Snob's wry descriptions just to keep going. steve-- good point on the distance rule of thumb. i'm guessing the city engineers use the overall width of the street to determine whether there is enough room for a dedicated bike lane, taking into account minimum widths required for car lanes, bike lanes, and parking spots. they only paint bike lanes when there is sufficient space for all three. since these roads are so old and their width varies from block to block, sometimes the bike lane will simply "disappear" at a narrow section and re-appear again farther down the road when it widens. what really shocks me is what is happening in union square. after what seems like an eternity waiting for that quagmire of intersections to get reconstructed in a more bike- and pedestrian-friendly way, they've finally finished paving of portions of it and didn't include bike lanes!!!!! after all those promises!!! moopheus-- beacon street was actuallly supposed to be repaved last year, but because both beacon st and somerville ave are major thoroughfares through the same city, they decided to hold off on beacon until somerville ave was completed to avoid too much disruption of traffic flow. my guess is that reconstruction of beacon street will commence next spring. 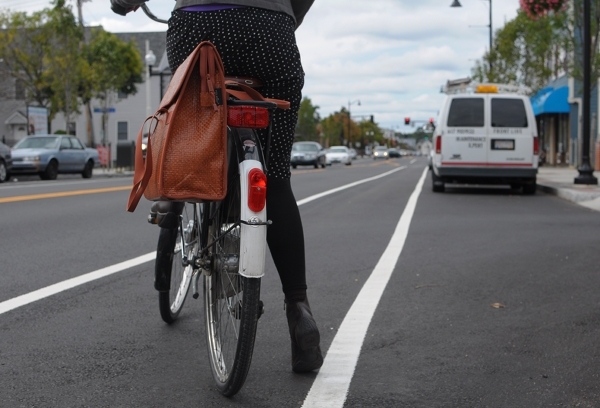 Great post and suggestions about riding in bike lanes! Unfortunately riding to the far left in most bike lanes doesn't keep you out of harms way with regards to doors, but it's better than setting yourself up to take the full force of a door I guess. And yes, passing on the right is incredibly dangerous - I've had other riders pass me on the right with no announcement just as I was about to move to the right to avoid a pothole or some other road obstacle! 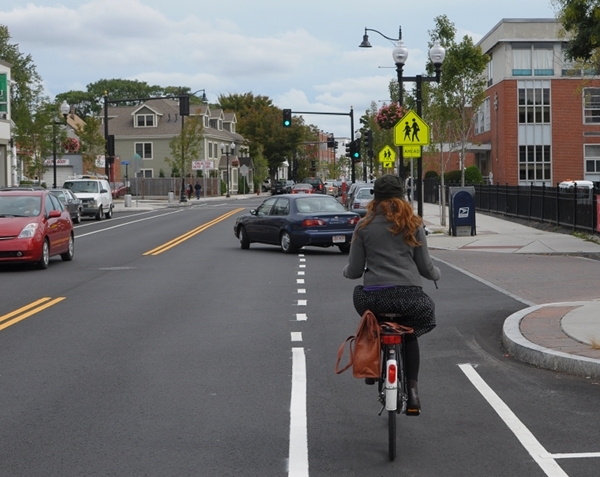 Great post :) I was in Somerville yesterday and waht a pleasent suprise to see Somerville ave all nice with a bike lane. When I lived in Somverville I used to ride on this road daily for 16 years only to dream of it being this way! So many great things happening all around. I pretty much agree with regard to the bike lanes - the one thing I would mention is that, unless you are going quite fast and can't watch the parked cars to the right, I would ride more towards the middle of the bike lane - if you ride way to the left, parts of your body and your bike are then actually in the traffic lane to the left, even if your tires aren't. To be honest, I'm not a huge fan of painted bike lanes, and I'd prefer to ride on a non-segregated, low-traffic street most of the time if possible (and until we get more real bicycle facilities), but if you have to ride on a busy street, it's nice to at least have some space of your own. A lot of cyclists here stop in crosswalks, and it drives me crazy. Even when there is a bike box at the intersection so they can sit in front of car traffic, they will pull through the whole bike box and sit in the crosswalk in front of it. I just don't understand. It was funny being in Amsterdam and seeing people walking luggage with rollers down the bike paths. I guess if you come from a place where you never think about bikes, you assume it's just sidewalk (since often the bike paths are not grade-separated from the sidewalk, just a different color). One thing that I really appreciated about bicycle infrastructure in Amsterdam, as opposed to Portland, is that it is clear, well-marked and consistent throughout the whole city. There is none of the usual thing that happens in Portland where you'll be in a bike lane, and suddenly it will end, leaving you in the right lane of a three-lane road with fast traffic, or a bike lane which only appears for about 10 feet, so you have to merge out of traffic to go in the bike lane, then merge back into traffic as soon as it ends. Not to mention, we have so many different types of signals and infrastructure in Portland from "testing" things that then never get implemented on a city-wide basis, it can be really confusing sometimes just trying to figure out what all of it means and is used for. Great advice. I wish there were more (any?) bike lanes up in Salem, so that I could use this advice. I usually find it better to stop just beyond a crosswalk instead of behind it. Ron - When stopping beyond the crosswalk is possible I do it too, because it both gives me a head start and doesn't interfere with pedestrians. But if the light is already red when I get there and people are already crossing, it isn't possible to do without interfering with pedestrians. Mr. Colostomy - The kind of scenario I am thinking of, is, for instance, when a car makes a turn but has to pause in order to merge with traffic while its rear end is still in the bike lane. As a cyclist in the lane, I see this and have a choice to either slow down, pause for a few seconds if necessary... or to attempt to go around them somehow - which will actually keep them from completing the turn and keep them in the lane longer, inconveniencing other cyclists. Here in Phoenix, we have very few bike lanes but very large sidewalks. It's very scary trying to ride on the small asphalt roads at night among the cars hoping they will see you and be able to go around you. Meanwhile, I hate to ride on the sidewalks no matter how wide because I really feel like I'm doing something wrong. I'm always glad to hear that more cities are making more bike lanes and I'm hoping that our city will "get it" sooner than later. The law depend on the city police, and what they understand as legal. Here in my city, at a car-bike fatality, the police woman spoke to the TV news reporter and said "it is a shame, he should have been on the sidewalk where he belonged"
We are slowly getting a few bike lanes, but cars use them too. We just got a whole slew of new bike lanes in downtown Salt Lake City. Well, they are actually shared bike lanes with cars (there is just a green bike 'path' painted in the middle of the traffic lane). Essentially they are just telling motorist that bikes can use the whole lane. I don't love the idea of a sharing a lane with a car. Feeling their engine and impatience breathing down my neck, especially when I am on my slow Pashley and can't keep up with traffic. But I suppose it is better than being off in the gutter where drivers are still annoyed that I am not over far enough when there is really no safe place for me to ride. At least in the shared bike lane, they may be annoyed but they can't really say anything about it since I am exactly where I am allowed to be. Another plus, they can see me clearly and act accordingly. It sounds as though you don't care for Boston very much...so why not move? it does not sound as though you are tied down caring for elderly parents or tied to schools. And the cat will no doubt readjust to a new view. So if that is what would make you and the CoH happy...take a risk...pack the bikes...hit the road. After all, you can always come back if the cows are ill-tempered and the rural life does not suit. It makes me a little sad to think that someone is not pursuing her dream if she can. And you seem very much like the sort of person who can. kara-- that's exactly the point of the shared lane markings: it tells drivers that cyclists are "allowed" to be on the road just as are drivers, and it brings (hopefully) a level of awareness to drivers that there are cyclists who may be using the road too. dave-- not all local police have the same understandings of the laws, especially new laws. i know that here, there are some police who don't like to accept that cyclists have certain rights, and see them as a nuisance (the old "why can't they just drive cars like the rest of us" mentality). then there are others who are very supportive of cyclists. i think the laws are changing so rapidly and many police just don't bother to keep up with them. for example, i almost got doored by a cop parked on the side of the street. he never bothered to check for cyclists in the bike lane. yet, there's a new law in MA that makes it a requirement for drivers to check for cyclists before opening their doors into traffic. (how enforceable such a law is is anyone's guess, but hopefully even if not enforceable, it will eventually bring an awareness to the general public). Great post and much needed. With each new school year here in Flagstaff along come a whole slew of new bicycling NAU students unused apparently to biking on city streets. The most common problems I observe are failure to properly signal and traveling the wrong direction on a bike lane. Usually, the student/rider is not only traveling the wrong direction in the bike lane but on the wrong direction on a one-way street. Ah, one of my favorite topics. Door zone bike lanes. DZBLs. I agree with Samantha, above, who says riding on the left of the bike lane doesn't neccessarily keep you out of the door zone. Open car doors are 35 to 45 inches wide, reportedly. 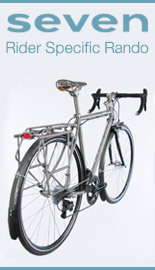 Your handle bars/elbows need at least another 2 feet width. If a car is parked very close to the lane (look at that car in front of the van in your first three photos) there is precious little if any room in the lane if a door swings open. DZBLs make you ride a tightrope between the door zone and the vehicles passing by on your left. The passing motorists don't know this and think you have a whole bike lane to yourself when really you do not, and you need the option of going into their lane and they don't understand or expect this. To me these kinds of bike lanes advertise a safety factor that is false, and serve to cause confusion and a possibility for surprises between motorists and cyclists that are dangerous. Be careful everyone. I've read many of your comments on this blog. You strike me as the kind of person who'd offer constructive criticism to a fellow cyclist, yet you'd acquiesce to a badge (... a glorified title, if you will)? Dafuq? I think the only point I'd disagree with is the one about your positioning in the cycle lane so as to avoid parked car doors. As a part of learning to drive (certainly in the UK) you are told to watch for people exiting parked vehicles, as well as when you are parked to watch for other road users passing before you exit. That being the case, the onus is on the occupant of the parked vehicle to be aware of you cycling past. Asside from that, I would rather cycle into an opening car door than be hit by a wayward car as it passed me by. My view is that you ought to be either in the centre of the cycle lane, or preferably towards the inside of it, and not near the busy traffic. The lane is there for your safety - it would be a shame to not use it for such. Unfortunately most drivers in the USA do NOT look before opening their doors, and unfortunately hitting a door or being hit by a door being opened can have devastating consequences far beyond the impact of the door. If you are knocked sideways or fly over the door, it is quite possible to land in the traffic lane under the wheels of oncoming traffic. While the danger of traffic coming up behind you while you cycle in the bike lane (or shared road lane) is real, the statistics I saw still point at "doorings" as a more serious threat. It makes sense to choose the lesser evil here. My personal take on it is: The people who are behind you can/should see you ahead, but the people opening the door do so when they don't see you or don't even think to look. It also happens to be a very violent dismount, capable of serious injury. I'm confused about one point. If you're riding to the far left to avoid dooring, but you want people to pass you on the...left, aren't you leaving no room on the left for them to pass you? I'm a novice biker and I don't always know when people plan to pass me but if they yell out "on the left" if there's room or "on the right" - fine. But it just seems like riding all the way to the left is asking for them to pass you on the right? Or expect that they announce they're passing you, have a dialogue about it, move and then they pass you on the left? I think bike lanes are not generally designed for two bikes to travel side by side. 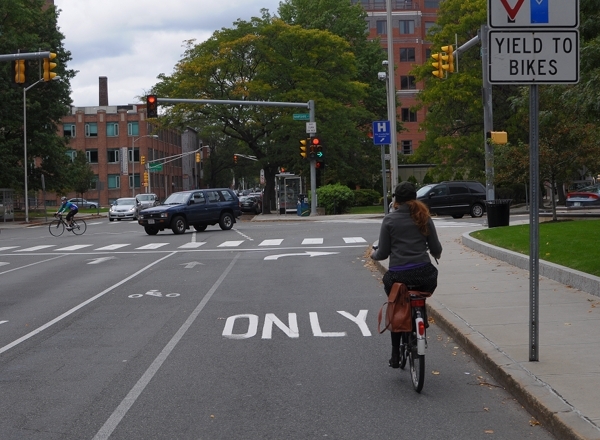 Passing within the bike lane, on the left or on the right puts cyclists closer together than is safe. What follows is that the passing cyclist must first look back and then temporarily merge left with car traffic to pass safely. That's what I do, anyway, and if car traffic is either too heavy, or too fast or too slow, then I can't pass and must wait. I've had cyclists pass me on the right, squeezing between parked cars or utilizing a gap in them and it's very unnerving. Fortunately, this only happens rarely and most cyclists here appear to know to pass as a car would, on the left. boycott bike lanes. they create more problems than they solve and, in my neck of the woods, they send the worng message to drivers re: the cyclists' right to the road--ALL roads, excepting freeways and suchlike. Anon 11:20 - I am comfortable cycling both in traffic lanes and in bike lanes, but in Boston I have to say that the behaviour of drivers has notably improved on roads where bike lanes have been placed. I'm also somewhat ambivalent about whether bike lanes are a good or a bad thing precisely because it can send the message that cyclists are somehow not entitled to use the roads as motorists are. Sharrows and "share the road" signs seem as though they might perhaps be a better option, but then again sometimes there are some apparently significant gains in safety after bike lanes go in. I'm fortunate to live in a very bike friendly community here in the Fraser Valley, so most motorists actually seem to be quite accommodating and so far I haven't had any close calls despite the lack of bike lanes. It definitely was much scarier riding in Vancouver when I used to live there. We've just returned from Provincetown on the Cape. Everyone cycles in Provincetown, it's simply like nothing else. Maybe it's the unique traffic situation, (driving a car there is a huge hassle) but there are no bike lanes yet drivers are extremely courteous while passing cyclists not just in town but everywhere else. Cape Cod is some sort of velo-paradise. Hi. I'm the same anon from 11:20pm. I suspect drivers are better behaved on the bikelane-equipped roads b/c they see the signs and road paint, and therefore *know* that you're "allowed" there. The problem is, on roads without bikelanes, they think you're not "supposed" to be there, as there is no bikelane. 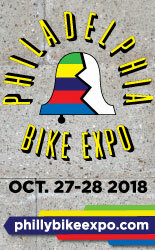 In Philly last here, some blowhard in one of the dailies was anti-bikes at all, and his argument, such as it was, relied on the notion that cyclists should stick to the roads with bikelanes. We need better education for all roadway users *far* more than we need bikelanes. Having bikelanes on roads that are already open to bikes seems redundant. We might as well try to ride 2 bikes at once, while we're at it. rob, MDI, good comments. Interesting the diversity of strong views on this, among cyclists. That says something. Thanks for this post Velouria. @MDI: We experienced a very similar thing in Amsterdam, where in the main center of the city, there are a lot of roads where bicycles, pedestrians, and cars all share the roads, and people were very patient and considerate, when needing to pass and when being passed. Of course, the population in the center of the city is dense enough that you can't really drive very fast even if you wanted to, so probably people just get used to it and don't worry about it. The whole feeling of the city there felt much more relaxed and much less frantic than most places we've been in the U.S. - which of course makes for nice traffic, because you know people are actually watching out for you and will stop or move if they need to, they're not just in a huge rush to go as straight and fast as possible (both people driving and on bikes). I love the blog btw, keep up the awesome work. Daniil--good point re: turning. I agree that bikes turning right should occupy more of the turn lane to avoid cars squeezing in. There is a narrow bike lane there that suddenly expands into a turn lane (that you see in the picture) while the real bike lane continues straight. It indeed sets you up to be too close to the curb, unless you first look to your left and merge to centre at the moment that the turn lane appears. Whats most important is to look how other cyclists and traffic behaves and adapt to that. In Sthml you get run over if you walk in a bike lane or bike path. Bus drivers are totally lacking sympathy for life and limb of all other traffic if you walk in their lanes or designated areas. And dont count on cyclist to ring a bell, they are likely to just pass you at one Angstrom´s distance!